An event nearly two decades past. A fateful encounter that would forever change a young man’s destiny. A videogame that changed the very state of the videogame business. A pretentious introduction to a mediocre review. One of the first videogames I ever played was Dragon Warrior. Somehow, at four years old, I managed to enjoy the game. I imagine the story seemed pretty interesting, considering I could barely read. It probably helped that I could fill in the massive plot holes and incredibly boring gameplay through the power of my imagination, and I did like knights and dragons and stuff when I was a little dood. However, now that I am an adult, I can see the game for the terrible lack of effort that it is. Every aspect of the game had already been produced elsewhere, and the only credit it should be given is for pioneering the horrible frontiers of JRPGs. 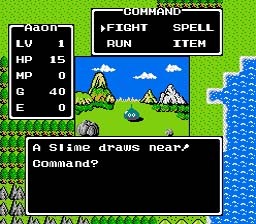 If it weren’t for Dragon Warrior, there might have actually been some creativity in Japanese role-playing games. And the original Dragon Quest in Japan somehow actually managed to be worse than the American release. Well, OK, it’s likely that the Japanese RPG scene would have turned out the same, even without Dragon Warrior. “Lacking creativity” is to Japanese RPGs what “incredibly boring” and “overly complicated” are to Western RPGs. The point is, Dragon Warrior never really became that popular in the West, and for good reason. The only reason I ever enjoyed it was because I was an overly imaginative child who lacked the reading capability to fully understand that the dialogue was inane. Despite all of this, the game is legendary in Japan, and we’re still being flooded with copies using the same fundamentals two decades later. Dragon Warrior has barely average graphics for its day—and it was an improvement over the original Dragon Quest. The battle graphics and monsters are decent enough, but the map design and tiles are terrible. All of the maps look flat, and everything is separated into single-block chunks, which makes the world map look ridiculous. And when you first start the game and are greeted by a king running in place on a brick floor, surrounded by carpet samples, in a room that seems to be encased in that bumpy, grey foam stuff that they pack computer parts in, you can basically guess what the rest of the game is going to be like. “Iconic”, I believe is the term. The music actually isn’t too bad, however. It was mostly decently composed, and it has a clean sound to it, although there are the requisite ear-bleeding tunes thrown in to meet release standards. Overall, it is pretty much on par with other games of the time. In general, the game is barely average for is time. Sure, it was the first RPG released on the NES, but that’s like saying that Final Fantasy VII was the first Final Fantasy on the PlayStation. Many better games were released before it—the only thing it had going for it was that it was the first on that specific system. It merely collected aspects found in other games and put them together into one mediocre blob. Or, I guess it would be a slime, in this case. Lelelelele! The one thing truly bad about this game is its controls. In order to interact with any object, you have to enter into a menu. It’s kind of like EarthBound, if EarthBound also required you to select a separate and unique menu item to open doors, climb stairs, or pick up treasures. This is especially annoying when you walk up to and NPC and try to talk to them, as they have a tendency to walk away while you’re pressing the button—forcing you to close the menu, walk over to where they moved, and try again. There are other minor annoyances, as well. For example, button presses are only polled two or three times every second. This means that tapping a button once will not achieve the desired result. You have to hold the button down until the game registers that it is being pressed. If you hold the button down, however, it may register twice and send you too far or enter you into another menu. A small problem, but considering the rest of the game, the little problems begin to add up. So, overall, the game just isn’t fun. The vague story is drawn out over tedious and poorly-defined sidequests, requiring you to slowly traverse the gameworld, fighting random battles every step of the way. And, as if there aren’t enough random battles to begin with, much of the game is spent seeking them out in order to level up or buy equipment. Not a lot has changed in the world of JRPGs. Even so, the game had an effect on me at that age. Kind of like Curse—you kn ow, one of those status effects that lasts between battles, and there’s no item to cure it so you go back to town, but after going to the inn you find out that you still have it, so you have to find the town that actually has a priest, and by that time, the character is dead. It’s a lot like that, really. But, for as bad of a game as it is, it forever determined my choices in gaming. While I can’t stand to play the game anymore, I still have a complex about JRPGs. The more generic and cliché, the better! And I blame it all on Dragon Warrior. My first RPG. How sad.